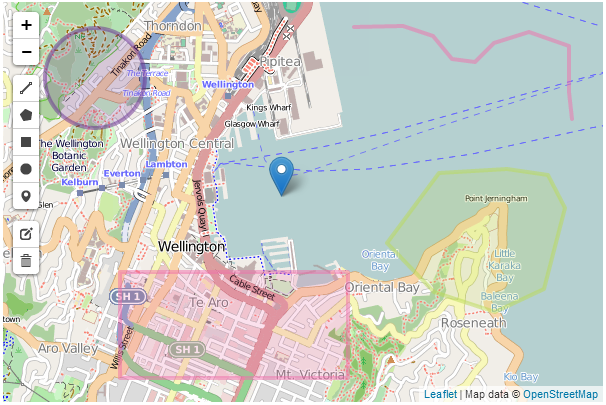 1) Used Leaflet to create a toolbar which could draw polylines, polygons, rectangles, circles and markers to a map and then edit or delete those objects as desired. This was done using a leaflet plugin Leaflet.draw which has a github source here. Although this was not a part of my project, I thought it was important to get familiar with the use of a leaflet plugin as I plan to prepare one myself. The main image and the following one demonstrates it's use. 2) Understanding and preparing mathematical equations for non-affine/projective transformations of images. 1) In case somebody is familiar with the mathematics of non-affine/projective transformations, it would be really handy if I could have a quick hangout on the topic. Thanks Anish. This was a bit outside the scope of your project, but I'm glad you learned from it. Sharing this might help some other Google Summer of Code students who are working on similar problems, for sure! Neither Jeff (in his thesis) nor that guy actually discuss the mathematics behind a projective distortion. It is assumed to be already known or a task left to the reader. So, as a reader, let's see what we can find out! We'll learn this together. Here are some links I have found just now. From that, I get that projective distortions represent a very, very wide class of mathematical mappings. Which means we aren't going to learn much about it for our use case without being a bit more specific. Now that we know "homography", let's see how homography has been implemented! It seems like each person referring to a homography matrix either "has one" or "found one", but I can't any information about where the matrix comes from. That page says clearly and directly that projective transforms are more general than affine transformations. So maybe we cannot truly represent a projective transform with only affine transformations. At some point maybe Jeff will hop into this conversation and tell us where to look to find how four points chosen on an image relate to the matrices we are learning about. I suppose I could go read the source code. I suppose I should go read the source code. All the math is right there. Maybe there will be comments! That's true - projective distortion cannot be achieved with an affine transformation. The existing Cartagen/MapKnitter 1.0 code is just a wrapper around some existing code (using that matrix class) which I convinced someone to open source (the guy you found, Bryan). You can probably just clip that code out of Cartagen and hook it up to a Leaflet 4-sided poly. The divide function is the real meat and potatoes of the image warping. The Warper library is certainly helpful. A quick mathematical review of what Warper does for us. It creates a mapping from homogenous coordinates (used to simplify projective transform calculations) to cartesian coordinates (the x and y of the original image). The homogenous coordinates are defined on the "unit square" for the mathematics implemented in divide, and the homogenous coefficient w is set to 1 in all cases. The divide function breaks down the large image into smaller subimages. The subimages are broken down further until a very small rectangular selection is chosen. An affine transform of that small section is performed using graphics libraries (Canvas in this case). Although each maximally divided piece of the image has an affine transform, when the pieces are put together, the result approximates a discretized projective distortion. This comment is a summary of what Anish and I came to realize after looking over the maths together. Maybe it will help others. Anish and I agree that the Warper library needs more documentation. Hi, Bryan - thanks for the post. Much of the original warp function was copied in from a web demo, and it took me a while (way back when) to decipher it. I agree it could use more documentation -- perhaps a few code comments could be part of Anish's work in porting it?